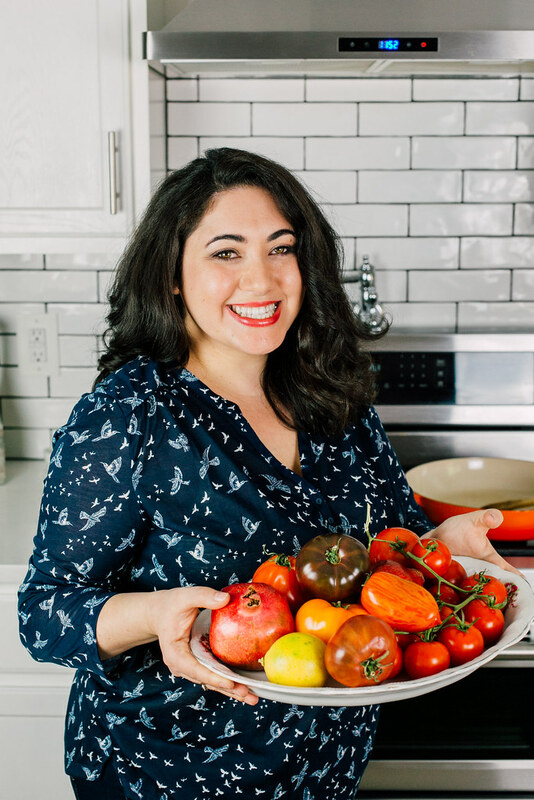 I have a running bucket list of recipes I’ve always want to conquer. It first started with French cuisine when Joe bought me the Art of French Cooking. Since then, I’ve visited cuisines I never thought would have crossed my pallet but most recently, childhood favorites and tastes is what I want to recreate now. My friends tease me because I joke that growing up Jewish, all I did was eat some sort of cured, pickled or smoked fish either coming out of a jar or some sealed package. But that is how our ancestors preserved their foods. 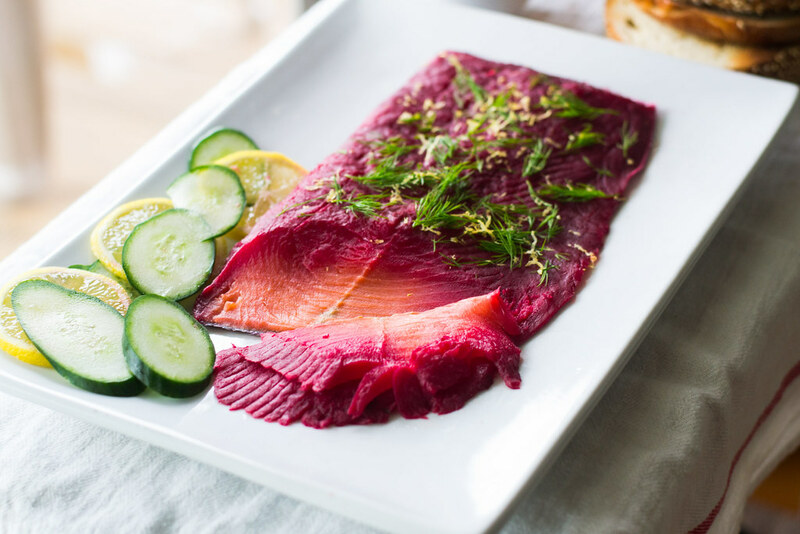 Pickled herring is near and dear to my heart (also on the bucket list), and finally I can say that I have made my very own beet cured lox. Yes, curing your own lox couldn’t be any easier. The only tool you need is time. I have to say, since moving to the Pacific Northwest, I have made some amazing new connections and met some awesome people. One of them being from Alaska Gold Seafood Cooperative. They are a seafood producers cooperative based in Alaska and their home office is based right here in Bellingham, WA, just a few minutes away from me! Alaska Gold ships directly to your door with fresh salmon that is flash frozen and air tight sealed right on the boat. The wild coho salmon couldn’t be any fresher unless you were fishing for it yourself! How absolutely gorgeous is that salmon. This is line caught, Kosher wild coho salmon that is literally the entire length of the salmon, so it ranges anywhere from 1-2 1/2lbs, skin on. 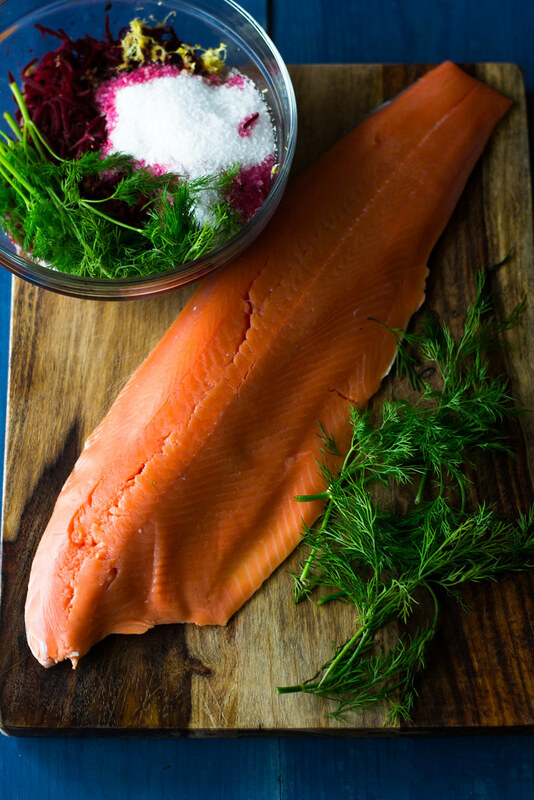 I really wanted to make a big impression with this beautiful wild salmon and I couldn’t wait to make beet and dill cured lox so I could really taste how pure the wild salmon is. 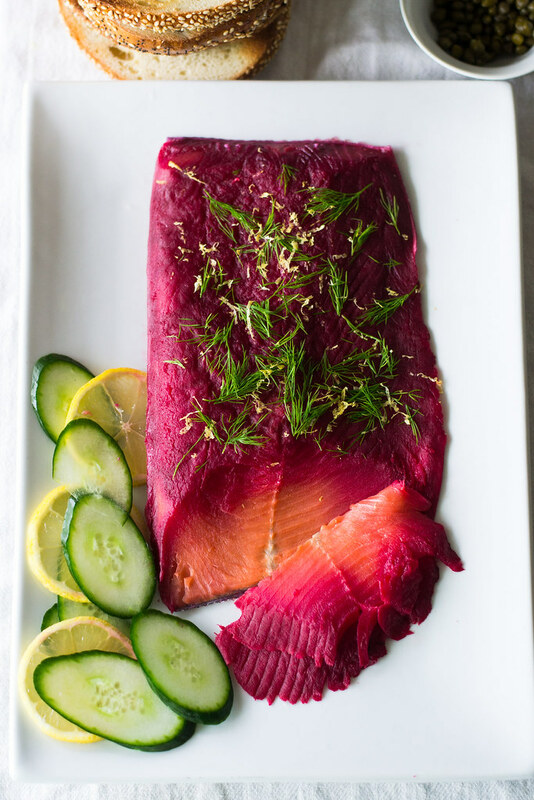 And when I say making your own homemade beet cured lox is easy, I mean it’s easy. The only tool you need is time and space in your refrigerator. Of course you don’t have to use a 2lb, piece of salmon like I did, but we LOVE salmon and will eat it in every possible meal. Plus, this would be so perfect for a friends brunch with a build your own bagel bar (oh, that is a good idea) or just use a smaller piece of fish for a smaller group. A huge thank you to Alaska Gold Seafood for providing an abundance of salmon. There is nothing more delicious than wild salmon literally straight from the source and I so appreciate their honest philosophy of “one line, one hook at a time”. You know you are getting the best quality salmon there is! Firts make sure to thoroughly dry your salmon by pressing a paper towel all over it to remove any extra moisture. Then in a large bowl, mix together the salt, sugar, grated beets and lemon zest. Lay some plastic wrap across a large baking sheet that has sides so liquid doesn't spill over as it cures. A shallow baking dish works well too. Then spread out half of your mixture onto the plastic wrap, about the length of the salmon. 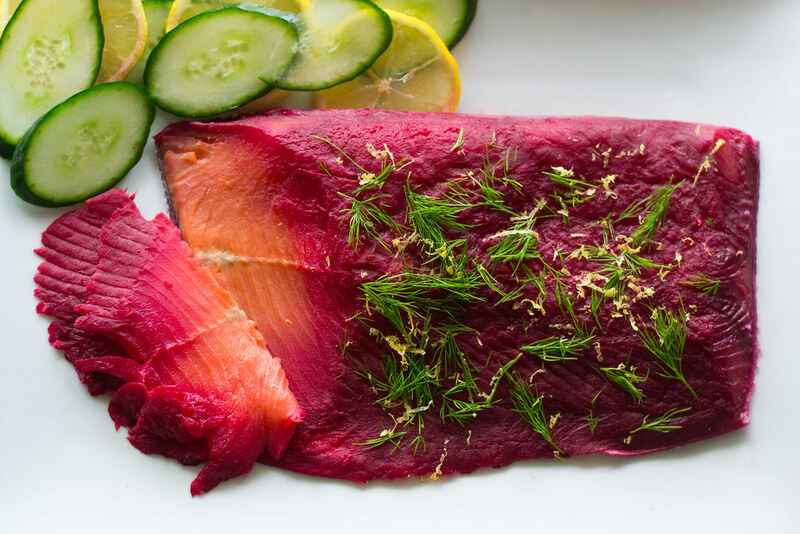 Place the salmon on top of the mixture and cover it with the remaining half of the beet mixture and then top with the fresh dill. Place another layer of plastic wrap on top of the fish with another baking sheet and use cans or anything heave to weigh it down. Then place your fish in the refrigerator and allow to cure for 48 hours. About halfway, I'll check to see if there s too much liquid and if you think so, pour it out and continue curing. Once the salmon is done curing, it will have shrunk up a bit and feel drier. Remove the skin and discard and slice the salmon as thin as you can on a diagonal. 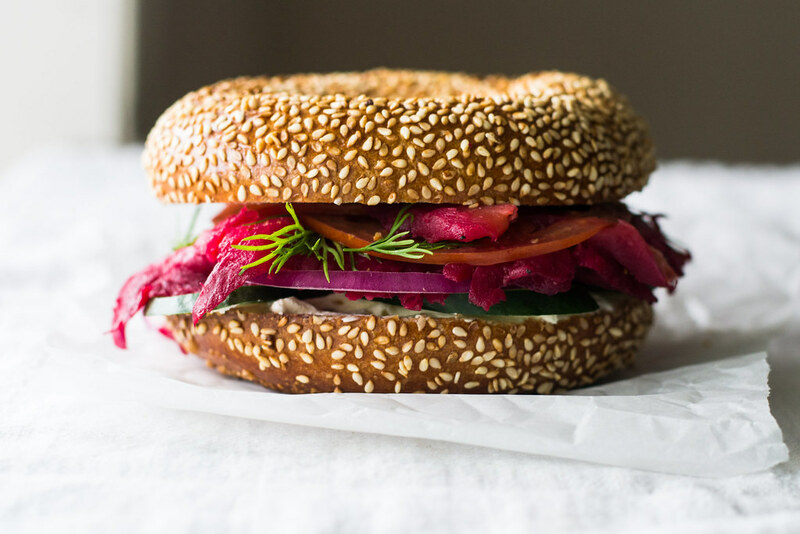 You can serve your lox on a bagel with capers, cucumbers, dill and cream cheese. This looks amazing! I would never have guessed curing your own lox would be so simple – it may just have to go on my bucket list too! I will never look at beets the same way again… thanks for posting!